Below are the five key findings from the Budget and Tax Center’s analysis of the new 2013 poverty and income data from the US Bureau of the Census. The state is making no progress towards eliminating poverty. North Carolina’s high poverty rate (17.9 percent) remained statistically unchanged in 2013. This means that there has been no progress towards alleviating poverty (as measured by the official poverty measure) since before the recession hit. One in five North Carolinians lived in poverty, equating to less than $24,000 in income per year for a family of four. North Carolina has the 11th highest poverty rate in the nation. High rates of hardship persist because of the state’s ongoing job shortage and the rapid acceleration of low-wage work that fails to provide a pathway to the middle class. Children are the state’s poorest age group—and children of color, especially those under age 5, face shamefully high rates of poverty. One in four Tar Heel children lived in poverty in 2013. Poverty maintains the fiercest grip on children of color, with rates approaching, and in some cases, exceeding 50 percent for certain communities of color under age 5. As North Carolina shifts to being a state where a majority of residents are people of color, persistently high poverty rates among children of color will harm the state’s economy in the long run. Where you live shapes your access to economic opportunities. A large and growing body of research shows that where one lives can determine if one has access to the educational and employment networks that can pave a pathway to the middle class. Of the 40 counties in North Carolina for which 2013 data is available, the average poverty rate in rural counties is 2.3 percentage points higher than the average for urban counties. With that said, the pockets of deepest hardship exist primarily in inner-city urban areas in the state. So even within a county that is thriving overall, economic hardship can—and often does—vary greatly from neighborhood to neighborhood. The latest data on poverty released by the U.S. Census Bureau last week confirms that work does not inoculate adults from experiencing poverty. One in three workers in North Carolina earned poverty wages, up from a low of 24 percent in 2002. The proliferation of low-wage jobs not only makes it difficult for workers to support themselves and their families but it puts a drag on the entire economy by depressing consumer spending. The poverty threshold for a family of four in 2013 was $23,834. A full-time, year-round worker would need to earn an hourly wage of $11.46 to reach that level. That is well above the current federal and North Carolina minimum wage of $7.25 as well as higher than the proposed increase in the federal minimum wage to $10.10. And yet, low wage workers play key roles in the lives of our communities: they are home health aides who care for our parents or child care providers who are entrusted with the care of our children or bus drivers who get us safely to work each day. In the increasingly prominent public debate about the falling wages of workers and the failure of the wage standards to ensure work pays, this latest data provides further evidence that workers are not only struggling but that it doesn’t have to be this way. ess was made in the state for workers over the past thirty years but has been reversed more recently. North Carolina actually performed better relative to the rest of the nation through the 1980s and 1990s seeing a rapid decline in its poverty rate for workers over that period–an actual reduction from the high of 44 percent of workers earning poverty-wages in 1983. This faster decline is largely attributable to the state’s stronger employment opportunities than the nation in middle-wage industries like manufacturing and construction during that period as well as lower income inequality. 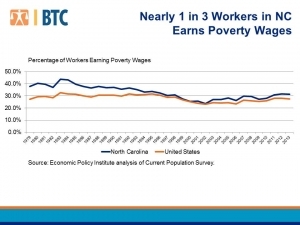 Beginning in the 2000s, those gains were lost as North Carolina began to see an increase in the number of workers earning poverty-wages. Contributing factors to this trend are likely the significant job loss in manufacturing and construction, the fallout of two successive national recessions and the significant growth of low-wage work since 2009. As of 2013, the share of North Carolina’s workers earning poverty wages was four percentage points above the national average. When workers earn poverty wages, the entire economy struggles as does the broader community. That is because as workers struggle to meet their family’s most basic needs, they are less able to consume on main streets or pay their rent or mortgage. Workers who work hard yet earn poverty wages seek out other ways to bridge the gap in their income whether that be through taking on additional jobs, reducing their time to support their children’s development and their family’s well-being, incurring significant debt through the use of credit or informal loans to make needed payments, or seeking out resources or support from private charities or public programs. The result is an economy that fails to ensure work pays and can support strong local economies through vibrant main streets and stable families. This is the seventh post in a series that takes a detailed look at the 2013 US Census Bureau poverty data released on September 18th. 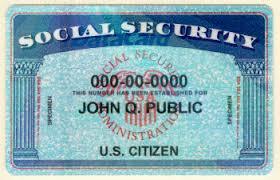 Previous posts examined: 1) how North Carolina is faring overall; 2) how poverty varies by race, 3) poverty by County; 4) child poverty; 5) the impact, or lack thereof, of the current economic recovery on poverty in our state and 6) the public success of Social Security in bringing down poverty rates for older North Carolinians. Read the entire series here.